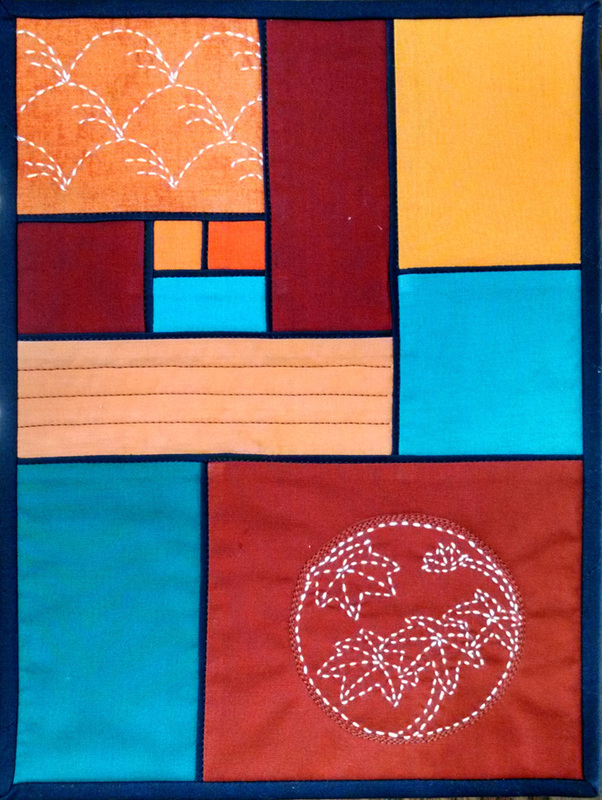 Once a month at two local shops, I hold an ongoing class called Art Journal Quilts. 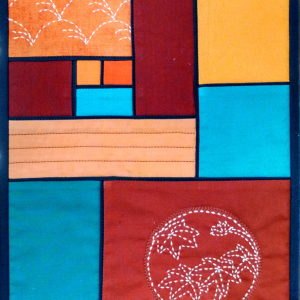 This class is aimed at exploring various techniques or design approaches that are more ‘artistic’ than the traditional methods/designs usually pursued in quilting. 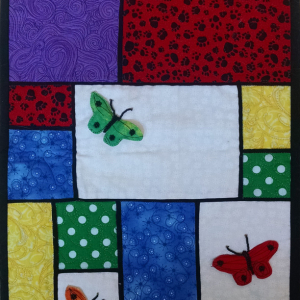 Fabric painting/printing, embroidery, 3-D manipulation, embellishment… we explore a different project each month to create quilts in a small format (which means they may actually get finished instead of floating around as UFOs). Some students attend and just experiment with the technique, filing it away for future reference but there are several who are quite prolific in completing their projects. 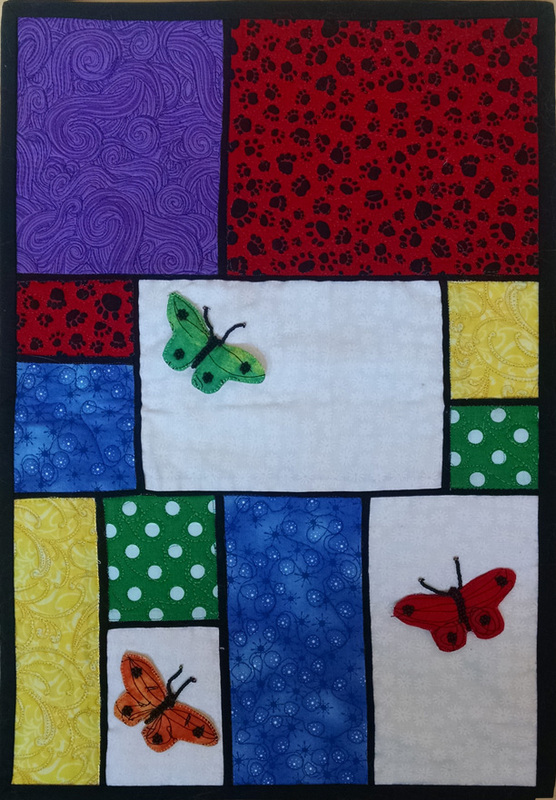 I am so delighted when any of them bring a completed project in following months to show and share with the class and over the years, I have built up quite a collection of photos of their quilts. 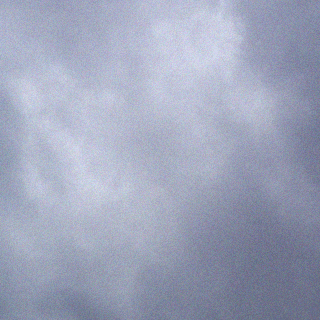 I hope to be able to add these to my blog on a regular basis. As much as I love posting pictures of my own work, it gives a better perspective when I can show the same assignment from different minds and hands. 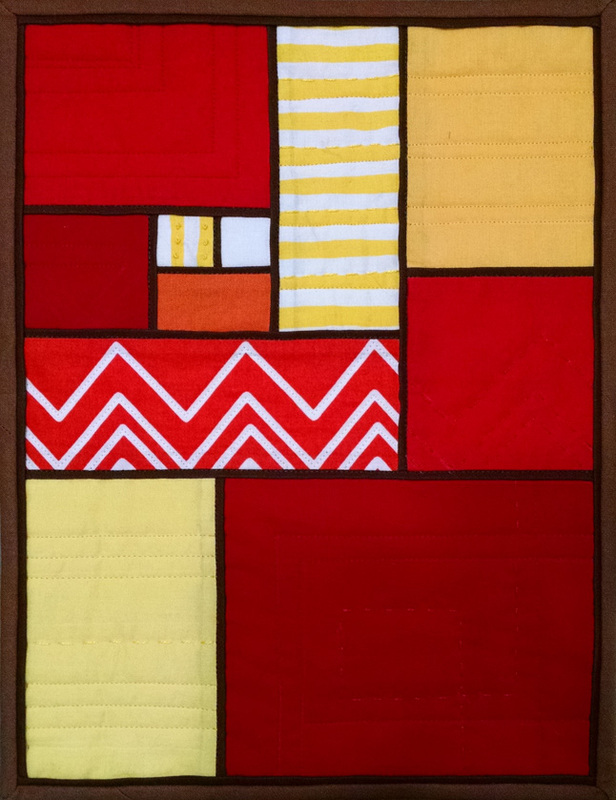 A couple of months ago, we played with flat piping to create very fine framing lines between pieced squares and rectangles. The resulting lines were far thinner than one could hope to create by inserting a narrow strip in the more traditional approach and also added a nice subtle dimension to the surface texture. 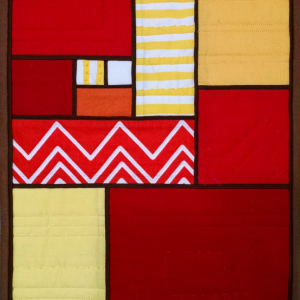 Though this method could be applied to any pieced design, I chose to use the work of Dutch painter Piet Mondrian as inspiration, his geometric arrangement of squares and rectangles in primary colors was a natural for this. 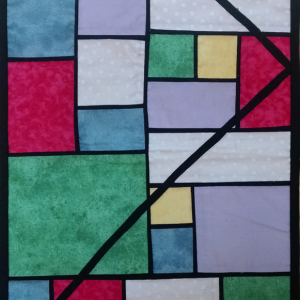 These small quilts were made from my Art Journal Class on Piped Mondrian. 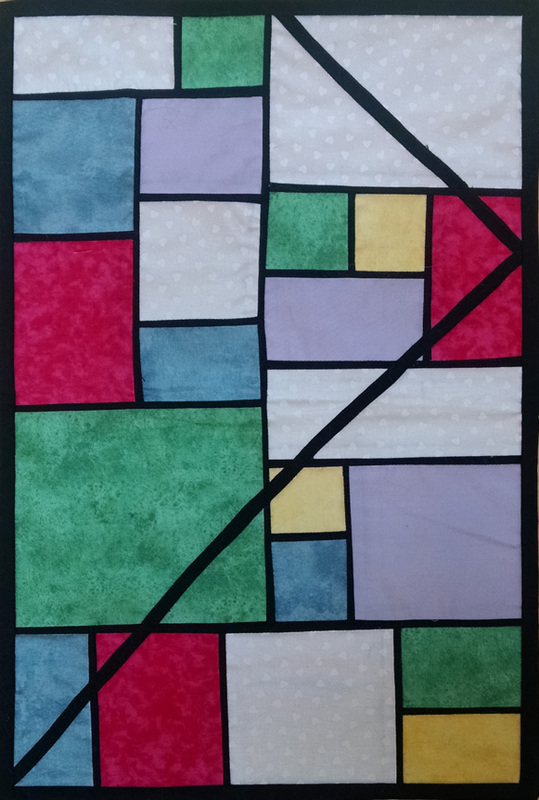 For those interested in joining one of my Art Journal Classes, they are held once a month at Pioneer Quilts in Milwaukie (usually the first Friday of each month) and at Sewn Loverly in Wilsonville (usually the last Thursday of each month); contact either shop for more information or to enroll. Please note that the projects and lessons will vary from month to month, the images shown above do not represent the class assignment for an upcoming class.